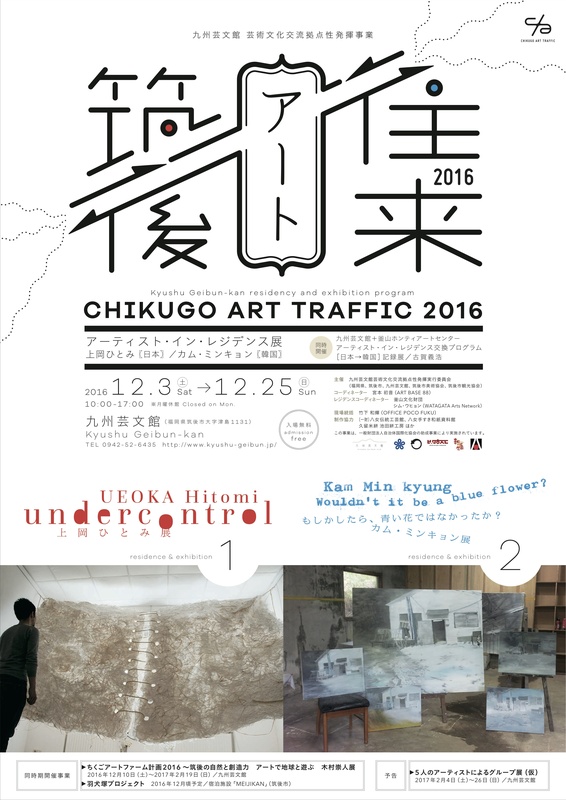 Chikugo Art Traffic 2016 Chikugo Art Traffic is an ongoing artist-in-residence and exhibition program at the Kyushu Geibun-kan since 2015. In the autumn 2016, two artists stay in Chikugo city and create new artworks, undercontrol by UEOKA Hitomi (Japan) and Wouldn’ t it be a blue flower? by Kam Min kyung (Korea). KOGA Yoshihiro had stayed for two months, August to September, at the Hongti Art Center, Busan, Korea and had a solo exhibition Water and where there is Water. It was an artists’ exchange program between Hongti Art Center and Kyushu Geibun-kan. In coming February, we will have a group exhibition with five artists, USHIJIMA Koutarou, HIRAOKA Masaya, KOGA Yoshihiro, MOULINETTE Hiromu and URAKAWA Taishi, selected by three curatorial staffs of Kyushu Geibun-kan (Feb. 4 to 26, 2017). KOGA Yoshihiro, SETOGUCHI Akiko, TANAKA Chisato, HIRAKAWA Nagisa.